Will Mayweather's future fights go for $59.95? By Jason Kim: It was announced that the Floyd Mayweather Jr. vs. Victor Ortiz brought in a respectable 1.2 million pay per view buys for their recent mega bout on HBO PPV. The fight sold for a whopping $59.95 on regular PPV and $69.95 on HD PPV. The fight turned out to be a dreadfully disappointing affair with Mayweather landing two cheap shots in the 4th round while Ortiz’s hands where down by his sides after apologizing to Mayweather for head-butting him. While a lot of boxing fans and boxers later on said that Ortiz deserved to be KO’d in that fashion what’s clear is that boxing fans almost unanimously felt they didn’t get their money’s worth for this fight. It was the worse way imaginable to win a fight. With Mayweather able to bring in big numbers despite the price hike in the fight, you have to imagine that the $59.95 for non-HD PPV fights is here to stay for Mayweather in his future PPV fights. 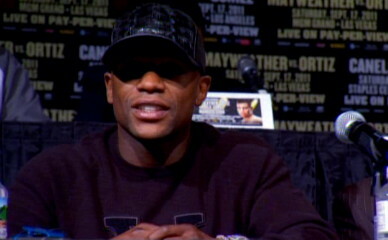 Whether there will be a backlash among angry fans due to the way the Mayweather-Ortiz fight ended is still unclear. It seems logical that a certain amount of boxing fans will be turned off by the way that Mayweather won the fight, and also at the steep price for the fight. Will there by enough angry fans to turn their back on paying $59.95 for Mayweather’s fights in the future? I think there might be. Mayweather could probably still sell if he lowers the price on his fights $10. Granted, he wouldn’t make as much money per buy, but at a lower price Mayweather could end up getting more buys overall. Boxing » Floyd Mayweather Jr » Will Mayweather’s future fights go for $59.95?